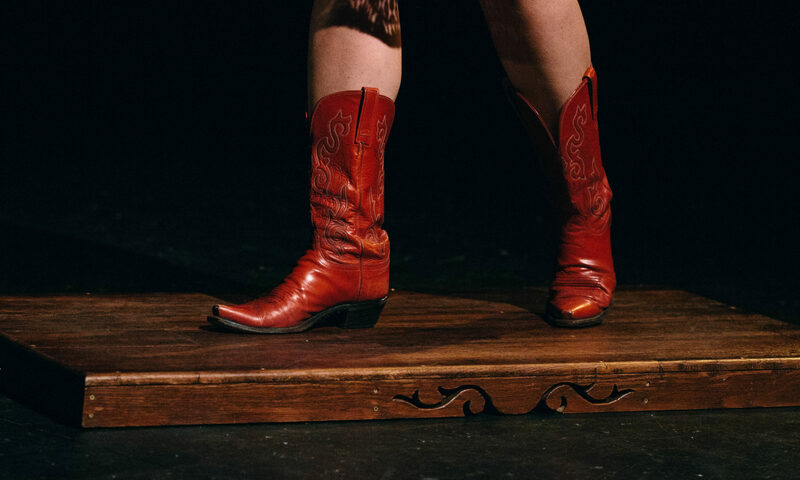 Janet Schroeder, MFA, PhD, is a percussive dance artist, scholar, and teacher, with a particular interest in tap dance, Appalachian clogging, and body percussion. She maintains her physical practice of these rhythmic dance forms throughout the U.S. and Mexico, creating and presenting choreography as well as taking and teaching classes. Schroeder’s explorations of rhythm in dance have recently taken her to Mexico, Appalachia, Chicago, New York City, the Berkshires, Greece, and France. Schroeder is currently Visiting Assistant Professor of Dance at University of North Carolina, Charlotte, where she teaches tap dance, modern dance for majors, tap dance repertory, and dance history. She recently completed a PhD in Dance Studies at The Ohio State University where she was awarded a Presidential Fellowship, an honor that recognizes outstanding scholarship and research ability, which provided Schroeder the opportunity to devote full time to her dissertation research during the final year of her program. Schroeder’s dissertation project is a comparative analysis of tap dance and Appalachian step dance, which specifically foregrounds the cultural values of “innovation” and “ongoingness” in presentations of the forms on the concert dance stage from the late 1970s to the present. Additionally, her analysis addresses these dance forms as ethno-racial projects and examines their roles in cultural representation to explore the stage as a site of ethnic and racial formation where different iterations of Americanness are on display. In addition to written scholarship, Schroeder has an active performance and choreographic practice. She is currently assistant artistic director of the Columbus, OH based tap dance company, Movement Afoot, with whom she also performs. As a freelance Appalachian step dancer, Schroeder has appeared at venues in Rochester, NY and Columbus, OH, as well as, very briefly, on the Great Wall of China. Schroeder is an in-demand choreographer for tap dance and body percussion pieces and has created works for professional companies and college students. These choreographies have appeared on stages in Brazil, Mexico, and China, in Rochester, NY, and at University of Georgia and Ohio Northern University. As an educator, Schroeder enjoys engaging with students in the studio as well as in seminars, working always to translate the social and communal values of percussive dance practices into the classroom. Schroeder has taught semester-long courses including Dance in the Global Context, Dance in Popular Culture, and Introduction to Dance, as well as studio-based courses in tap dance and contemporary dance technique. These engagements took place at OSU, The College at Brockport (SUNY), and University of Dayton. As a guest artist, Schroeder has shared workshops in body percussion, tap dance history and aesthetics, and composition at University of Maryland, College Park, Universidad de Las Américas, Puebla, Hathaway Brown School, Cranbrook Educational Community, and the Kristi Faulkner Dance Intensive. Additionally, Schroder is interested in engaging communities and audiences outside of academic institutions, and has enjoyed experiences as an advisor on an exhibit about dance at the Children’s Museum of Indianapolis, sharing body percussion with the group “In Motion,” an organization dedicated to bringing movement classes to adults over age 50, and teaching the basics of Appalachian flatfooting at small folk music festivals. From 2005-2010 Schroeder toured with music and dance company Rhythm in Shoes, and she continues to engage in percussive dance residencies in communities and universities across the country. She holds a BFA in musical theatre from Ohio Northern University and an MFA in dance from The College at Brockport, SUNY. “Shuffling with my dancestors: Embodying and transmitting cultural memory through tap dance,” Forthcoming. Collection on popular dance and cultural memory, edited by Clare Parfitt and published by Palgrave in 2019. “Tap Dance for the 21st Century: Michelle Dorrance Brings Artistry, Collaboration, and Innovation to Texas,” Arts and Culture Texas Magazine, December 2018/January 2019 edition. Scholar-in-Residence. Jacob’s Pillow Dance Festival, 2018. Program essays, pre-performance lectures contextualizing mainstage performances, post-performance discussions with artists: Dorrance Dance. Compañía Sharon Fridman. Scholar-in-Residence. Jacob’s Pillow Dance Festival, 2017. Program essays, pre-performance lectures contextualizing mainstage performances, post-performance discussions with artists: Tireless: A Tap Dance Experience Curated by Michelle Dorrance. Moderator for public conversation “Tap Today” with Michelle Dorrance and Dormeshia Sumbry-Edwards. Janet is currently living and working in Central Ohio, though she can often be found performing in other locations around the US and Mexico. This site is the online home for percussive dance scholar, Janet Schroeder. You can view performance videos, learn more about Janet, and get in touch! *Photos by Feikert Creative, unless otherwise noted.